[Special Price]Check the price at our booths. 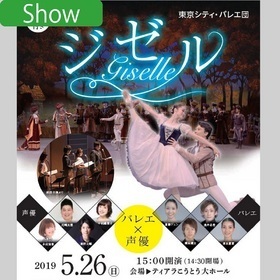 Ballet with Line and narration "Giselle"
Rare in the world collaboration performances the second installment of "ballet and voice"! ! Last year, become a big topic as unprecedented collaboration, it became a pioneer of ballet performances that can be enjoyed while deeply understand the story "with the words" ballet. It staged the pronoun "Giselle" of romantic ballet this year. Become a role, such as Serif narration of Kabuki "earphone guide", children and beginners, of course, you can also enjoy ballet fan together. From the voice industry "THE IDOLM @ STER" (Haruka Amami) Starring of Eriko Nakamura's like playing in, etc. it has been decided. State of the actors of the recitation of the stage poor forward Please enjoy. ※ performers are subject to change. Tickets Today are booths where anyone can buy tickets for performances, on the spot, without any hassle and at great prices. To help you experience Japanese art and culture easily, we sell same-day and advance tickets for over fifty carefully selected performances. Every day, we bring you the best in not just traditional arts and anime, but also musicals, plays, and dance. Our entire lineup for the day is released at 9:00 a.m.! We welcome foreign customers with in-store support in multilingual, including English and Chinese, and support for credit cards issued in foreign countries as well as UnionPay cards. c2015 Longrun Planning Corporation All Rights Reserved.